Professor Guo Qiyong is the president of the School of Chinese Classics at Wuhan University. His recent book The Characteristics of Chinese Cultural Spirit includes four of his lectures. 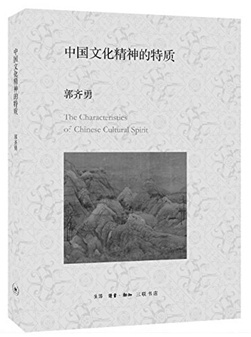 Every chapter focuses on a relatively independent topic, while as a whole they show different dimensions and characteristics of the Chinese cultural spirit. On the basis of the wisdom of former thinkers and his own reflections on Chinese culture, Professor Gao sums up in the preface the six characteristics of the Chinese cultural spirit. They include “Harmony in diversity and great virtues bear all things”; “Forever striving to become stronger and better”; “The supremacy of benevolence, righteousness and spiritual independence”; “People are the foundation of the state, which will be in peace when its people are well treated”; “Tackle things as a whole and consider them dialectically”; and “Address issues in a practical way and replace luxurious behaviors with thrifty ones.” Guo’s summarization of the Chinese cultural spirit is indeed comprehensive. Guo suggests that a comprehensive understanding of the characteristics of the Chinese cultural spirit should be achieved through comparison with foreign cultures, particularly Western modern culture. These six characteristics accurately demonstrate the life attitude, political philosophy and the way of thinking in Chinese culture. Some of these are of inherent universality, for example, spiritual independence. The universal value of these characteristics is not simply determined by the present situation where they are accepted, but also by their potential for being accepted by the people in the future under proper circumstances. Chinese philosophy is the philosophical foundation of Chinese culture. On the basis of the characteristics of Chinese philosophy proposed by neo-Confucians in the 20th century, Guo suggests Chinese philosophy has seven characteristics—natural vitality, universal harmony, innovative spirit, order construction, fostering of virtues, concrete rationality and the unity of knowing and doing. It is also a notable summarization of the characteristic of Chinese philosophy. A significant component of the modern values of traditional Chinese culture can be seen in its influence on daily life. Chinese culture stresses the philosophy of life, guiding daily living and individual behaviors through regulating these behaviors and activities. Confucianism, Buddhism and Taoism all show these characteristics. Confucianism highlights virtue and the wisdom of educating people through music, rites and courtesy. Taoism highlights the intangible and unpredictable essence of idea and nature, free from and unrestrained by worldly attachments, while Buddhism highlights disengagement and non-attachment. Guo suggests these are the most notable nature of Confucianism, Taoism and Buddhism.